Valet parking is one of the most common services you’ll get from an airport, club, hotel or restaurant. Usually, valet parking works this way: an attendant will be waiting for your arrival, parks and retrieves your vehicle whenever needed. This type of service can save customers a lot of time and energy from finding a parking spot themselves. But with the advent of technology, valet parking has evolved. Today, valet parking systems are automated which makes the experience faster and easier for customers. Valet parking systems also ensure that more customers are handled without compromising the quality of the service. This kind of technology is something which businesses should invest in because this can become their leverage against the competition. As a business owner, how your valet drivers are performing and how your valet customers find your service both play an important role in your growth and success. However, when you have too many drivers or customers, physically tracking their whereabouts are stressful, costly and might even seem like a tough task. The solution? Mobile valet parking management. This tool will help you track how your drivers are doing and how your customers find your business. Plus, this tool can also be used to monitor vehicle request and delivery parking times, and deliver this information to your driver regardless of their location. That’s fast and effective service for your business! Gone are the days when customers have to wait for an attendant in order to pay for their acquired services. With a valet parking system, customers can pay using different methods namely through a credit card. This software is very useful even if your business offers discounts or follows a unique rate structure. 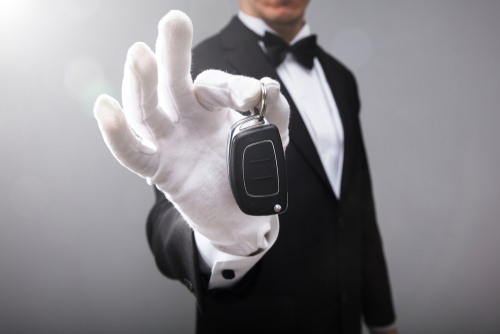 If you’ve been offering valet parking services for years, you’d know that there are some customers who are willing to take advantage of your business just so they can earn reimbursement or money from it. Prevent any fraudulent claims against your valet vehicles with a valet parking system software. This software will take pictures with the date, time, ticket number and location of the valet vehicle. These photos can help your business from paying unnecessary costs and face any legal responsibilities. If Apple has Siri, Amazon has Alexa. Alexa is a cloud-based voice service which is available on devices from Amazon. Valexa, on the other hand, is a valet parking skill which is solely developed for Alexa. This means that Alexa will now have the in-depth knowledge of valet parking systems. Using this kind of technology in your business is cutting edge and convenient at the same time. Customers can connect to other departments seamlessly without making any physical contact. Although being able to control all of your valet parking operations on a mobile or tablet is fun, there are several features which are compromised because of the limited screen size and device capacity. Several valet parking systems offer a desktop client-server which can be accessed either through a local or cloud-based configuration. Servers like these make it easier for businesses like you to virtually accommodate any customer’s valet parking needs. If you think these client servers aren’t tailored-fit for your business needs, scout for companies who can create one just for your business. Cvps.solutions can do the job for you – given that they’re the industry leader in providing valet parking systems and solutions. Having a customer wait for an attendant just so the latter can park a vehicle can adversely affect the image of your business. Customers don’t have the luxury of time and most often than not, they don’t like waiting. A valet parking system allows your business to use valet kiosks. These kiosks allow customers to request for their vehicles and pay using cash or credit card. Additionally, these kiosks can also provide feedback about the status of your valet vehicles and other important schedule pertaining to valet parking services. Valet kiosks are available in different colors and models. Undeniably, technology has made lives easier for everyone – and the business arena is no exemption. If you’re a business owner, scout for new apps, software, and tools which help your business stand out in the market. Offering valet parking might no longer be new but implementing a valet parking system in your establishment can make all the difference. In fact, this service might become your edge to attract customers and stay ahead of the competition!